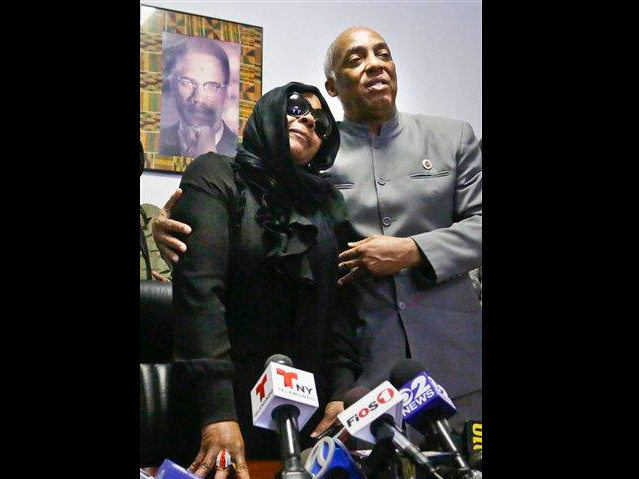 NEW YORK — Carol Gray, her head wrapped in a black scarf and her tearful eyes concealed by sunglasses, held up a photograph of her 16-year-old son, who was shot and killed by police. The picture revealed a grinning boy wearing a blue cap and gown, his arms wrapped around his mother. It was taken the day he graduated from middle school. "He was slaughtered," Gray told a room filled with reporters. "And I want to know why." Gray held a sorrowful press conference on Thursday to talk about her son, Kimani Gray, the kid nicknamed Kiki, who died on Saturday night after being shot seven times by two police officers. Police say the plainclothes officers opened fire after Gray pointed a gun at them. A .38-caliber revolver purchased in Florida was recovered from the scene. Gray was killed in front of his best friend's house as he left a Sweet 16 birthday party, said his grieving mother, who doesn't believe he could have pointed a gun at police. "Today was very hard," she said, and paused for a long moment before she was able to finish the sentence. "I had to choose the color of the casket that I wanted." The teenager's death has provoked outrage in East Flatbush, the working-class area of Brooklyn where he lived and died, a place that is among the city's most dangerous neighborhoods. Long-simmering resentment against the police officers who patrol these streets has erupted into violence in recent days, with 46 people arrested in the most recent protest on Wednesday night. A police officer was hit by an object tossed from a building during the protest and suffered a gash in his face. Gray, who was black, was with a group on Saturday night but left when he saw officers in an unmarked car, police said. The plainclothes officers, who were black and Hispanic, approached him because he was acting in a suspicious manner, police said. An organizer of Wednesday's event, Rickford Burke, said there's a deep feeling of frustration in the community that police officers regularly harass and target young black men. "The police department has proven to be racially inattentive to black communities, and this one is no different," he said. According to police, Gray pointed a .38-caliber revolver at them, and they opened fire. The officers involved in the shooting have been placed on administrative duty. "Our hearts all have to go out to the family of this young man," Mayor Michael Bloomberg said at an unrelated news conference. "So far, all indications are that the young man had a gun, and I can promise you that we will conduct a full and fair investigation." The public outcry, which has dragged on for several days, showed no signs of slowing, with another protest taking place Thursday night. On Monday, dozens of people threw bottles and damaged some stores. Surveillance video shows a cashier cowering in a corner as people looted his shop. "I understand that there's anger in the community, but the way to get answers is not through violence or law-breaking," said Bloomberg. "We cannot tolerate that, and we will not tolerate that." Bouquets of flowers and lit candles formed a makeshift memorial on the sidewalk near the corner where Gray died. Posters were scrawled with messages: "Love you lil bro" and "RIP Waking Angel." "Everybody loved him," said Shawn Burgendy, a friend of Gray's who had stopped by the memorial. "Never had a problem with him. He was just around a bunch of bad situations." Would his friend point a gun at a cop? "He's not that type of kid. He's not a dummy," Burgendy said. "He wouldn't just go and pull a gun on the police. Who would pull a gun on a police officer?" A police officer may use deadly force when he or she has a reasonable fear of serious injury or death, and police Commissioner Raymond Kelly has said the shooting appeared to be within those guidelines. Gray's death marks the 10th police-involved shooting this year. A weapon was recovered from every one, police said. In 2011, police shot and killed nine suspects and injured 19, the lowest in recent years, according to a police report released last fall. The 2012 firearms discharge report has not been published. Kenneth Montgomery, a lawyer for the Gray family, questioned the police department's account of how the teen died. The family wants to know how the gun was recovered and by whom, he said. The medical examiner's office ruled that Gray was hit seven times and had wounds in the front and back of his body, including his shoulder, rib cage, forearm and legs. Speaking of her son in the present tense, Carol Gray remembered a boy who still had a curfew to abide by at night. A boy who babysat his nieces and nephews regularly and who, for the first time in his life, recently got a bedroom all to himself. "The past couple of days, the bell hasn't rung," she said. "I'm still waiting for him to come home." While she doesn't condone the violent protests, Gray said she wants answers. She wants to know why her son was struck by more than one bullet. And she wants to know why she will have to bury him in the coming days. This is the second tragedy for the family: Two years ago, her older son was killed in a car accident. "Now I have to place my younger boy in the same hole," she said.